Designed by singer-songwriter and multi-instrumental sideman Pete Roe (Laura Marling, Mumford & Sons, Willy Mason, Ben Howard) and launched via a successful crowdfunding campaign, the Submarine is a unique, highly specialised and rather nifty guitar pickup. 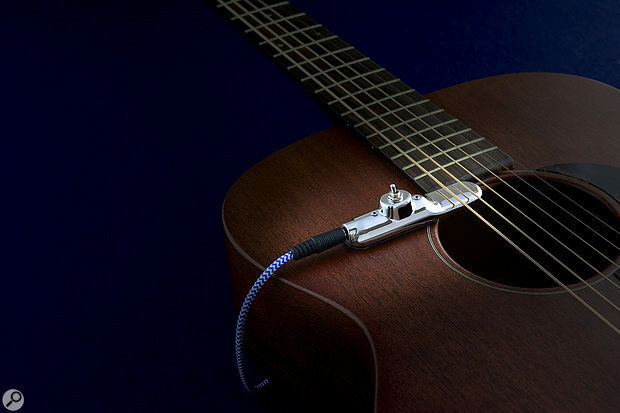 Attaching to the top of an electric or acoustic guitar via a microsuction pad, the Submarine is designed to sit under either the top two or bottom two strings, allowing you to send this signal through a separate amp and effects chain from the instrument’s conventional output for a variety of creative purposes. Adding further versatility, a small switch on top of the pickup lets you amplify only the outermost string (in other words, just the low E or high E if you’re in standard tuning), while you can also use the Submarine in stereo (one string per channel) by plugging in a ‘Y’ splitter cable. As I was putting the finishing touches to this review, a crowdfunding campaign was announced to develop a Submarine Pro model, a six-string variation in which each guitar string is picked up separately. We’ll look at that another time; for now I’ll focus on the original Submarine. The Submarine’s die-cast metal body is impressively compact, measuring roughly 20mm wide, 85mm long and 25mm high to the top of the switch. Aptly named, the Submarine’s shape calls to mind the baking powder-powered bath toys of years gone by. In contrast to the bulky black plastic of most (admittedly more sophisticated) hex pickup systems, it’s pleasingly retro and analogue, and it doesn’t look out of place on vintage-styled acoustics and electrics. Attaching the pickup using the microsuction pad couldn’t be much easier and feels pretty secure, provided that you’re sticking it to a clean, flat surface and the pad itself is free from dust and fluff. This will collect over time but is easily removed with a bit of sticky tape. The pickup comes off again with a firm twist and, thankfully, without leaving a mark. The Submarine also comes with a pair of adhesive-backed disc magnets that can be used to fix it more securely or overcome any problems presented by attaching the pickup across the edge of a scratchplate. As for carved-top and archtop guitars, the Submarine is probably not going to be suitable without improvising some sort of supporting wedge for it to sit on. Also included in the Submarine’s neat presentation box, along with a polishing cloth and serial number card, is a short mini-jack cable with a natty blue and white braided sheath, terminating in a quarter-inch jack socket. A velcro loop allows you to attach this to your guitar strap or endpin jack so that, when you plug a guitar lead in, the weight doesn’t pull the mini-jack out of the pickup or pull the whole pickup out of place. It’s a sensible measure, but you still may want to apply a bit of gaffer tape to make sure everything is going to stay where it’s supposed to before taking to the stage. When positioning the pickup, a pair of discreet notches indicate the location of the two one-string pickups concealed within the Submarine’s flattened nose, helping you to line them up directly under the strings. In practice, it’s just as easy to plug in and use your ears to find the right place to put it. A pair of hex screws either side of the switch allow surprisingly generous adjustment of the height and, to some extent, the angle of the pickup. Underneath, these screws are spring-mounted so there’s little or no wobble and the pickup stays where you set it. Listening to its dry, direct output, the Submarine sounds surprisingly good — like a decent, full-sized electric guitar pickup, in fact. It’s also impressively quiet and non-microphonic, barely registering knocks from a plectrum or to the guitar’s body. Like all magnetic pickups, however, metal-on-metal contact will make a noise so you’ll want to make sure the strings are not buzzing against the Submarine when you play. It’s not really intended to be heard dry, however. There’s a huge range of different ways to exploit this pickup using effects, limited only by the player’s imagination and stompbox collection. Perhaps the most obvious is to shift the bottom strings down an octave to add instant bass to fingerpicked acoustic. On an electric guitar, you might add some fuzz too for bass (and sub-bass) lines or monster octave-doubled power chords, but there are also much subtler ways to emphasise bass and lead lines picked out on the top or bottom strings, using reverb and delay, for example. Placed under the top two strings, the Submarine also lends itself to modulation effects, while some octave-up pitch-shifting and slapback delay can be used to create pseudo 12-string and sitar effects. It’s not completely plain sailing. Setting up two independent effects chains and amps then getting the relative levels right takes some effort and a bit of head-scratching. Thought needs to be given to what you actually play too — getting one guitar to sound like two is all very well, but the onus is still on you to play both at once! This is to take nothing away from the Submarine, however, which does exactly what it sets out to do. Like the best bits of musical equipment, it’s incredibly simple yet opens up a whole world of potential complexity. For two types of guitarist in particular — acoustic singer-songwriters looking to broaden their sound, and electric guitar players in bass player-less bands — it feels tailor-made, but that’s really just the start. If you’re the kind of player who is attracted by the idea of this ingenious device, you’ll doubtless relish the challenge of finding new ways to use it. Easy, damage-free installation and classy aesthetics. Dual outputs can be processed separately. High-quality pickup — sounds good, and relatively immune to knocks. Can be positioned for the top or bottom strings, and for two strings or just the outermost one. You have to get your head and hands around playing two parts at once! This simple but stylish device should appeal to singer-songwriter guitarists, and those playing in bands without a bassist. £95 (about $128 when going to press).